Among the pygmy rattlers and other snakes we found this afternoon in Lake Woodruff, we also stumbled across two of these snake lookalikes. I found a large one that scurried off before we could grab it or take a picture. Dr. Terry Farrell found this somewhat smaller one a little while later. It was very anxious to be on its way and I had to settle for this flash photo -- Terry is holding the lizard just a few millimeters to the right of this frame. 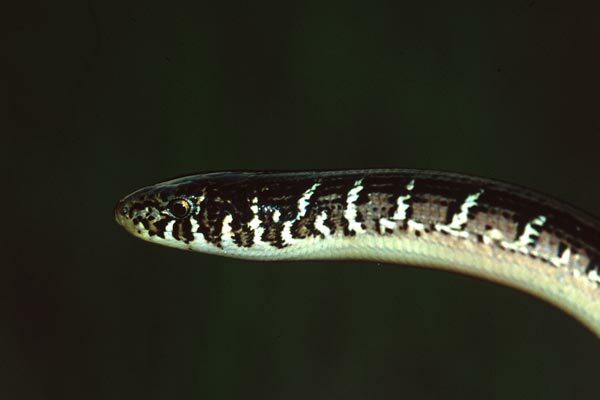 Glass lizards have no legs, so many people would assume they are snakes. But unlike snakes they have ears and movable eyelids and various other anatomical features that show their lizardness. The name "Glass Lizard" comes from the ease with which their tails drop off at the slightest provocation. Some predators are distracted by the wriggling tasty tail, allowing the lizard to make its escape. For more about the wildlife of Lake Woodruff, check out Dr. May's web guide to this refuge.